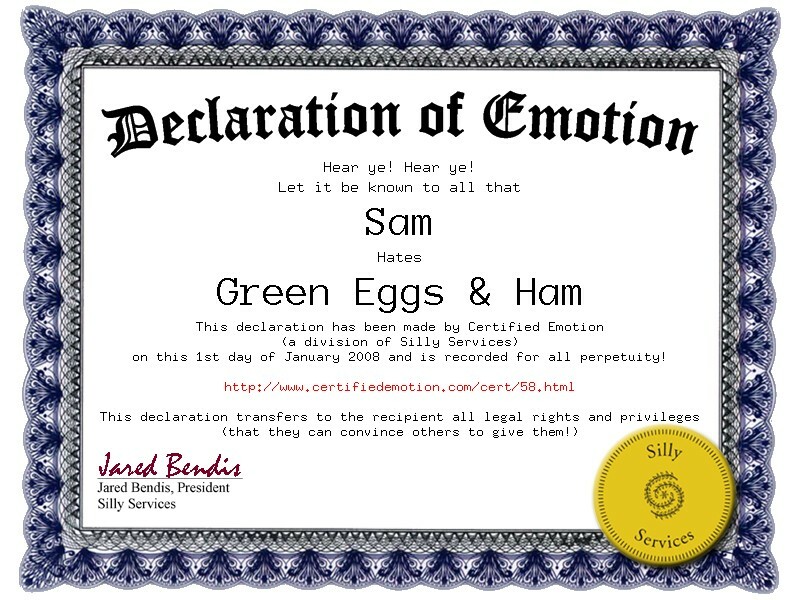 Certified Emotion is part of the Silly Services brand of websites created to amuse and entertain you (and also make us a little bit of money). Certified Emotion is a division of JaredJared Enterprises located in Cleveland, Ohio where Jared loves evervyone! To quote Descartes - 'I certify emotions, therefore I am'. We create an online customized Declaration of Emotion that documents that you feel the way you feel and all the rights and privileges that go along with it. This is available as both a weblink and a downloadable image (for integration into your website, MySpace, Facebook, or whatever). Sure. Go ahead and feel away but on this site it is only love, like, and hate! You have like - why not dislike? I give you an inch and you take a mile! We figure if you are bothering to get a certificate you might as well just hate that thing that you dislike. You mean I can love or hate anything? Well not quite. You can love or hate peas, but you can only love Tom Cruise. I mean you can hate him - you just can't do it here. Please remember we don't tolerate any hate speech here so go ahead and hate your vegetables but please love your friends and neighbors. We at Certified Emotion feel that there are just not enough silly services in the world. We also feel that we all deserve the right to express ourselves. What if emoting isn't my cup of tea? What if I run across someone who feels the way I do? Date them! Marry them! Listen to Pete Frampton together!